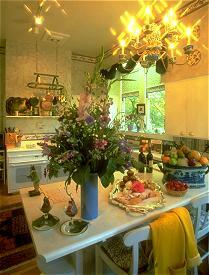 La Belle Epoque Bed and Breakfast Country Inn - Napa, Napa Valley bed and breakfast California wine country. This 1893 Queen Anne, built by a successful local hardware merchant, features multi-gabled dormers and a high-hipped roof. Original stained glass windows in the transoms and semicircular windows are just part of an extraordinary display of vintage and contemporary stained glass seen throughout the house. Fine Victorian antiques grace each of the six guestrooms and extend into the common areas, which include an elegant main parlor and dining-room with working fireplace, a plant-filled breakfast room, second-floor TV parlor, and the more informal Wine Tasting Room with adjoining cellar, where guests are invited each evening to sample local wines, hors d' oeuvres and engage in spirited conversation. The inn is within easy walking distance of Old Town Napa, offering a variety of shops, restaurants, the Napa Valley Wine Train Depot, and river front park. Wineries, hot air ballooning, bicycle rentals, mud baths, tennis, swimming, hiking, and golf are available nearby. Massages can be performed by a trained therapist on premises. 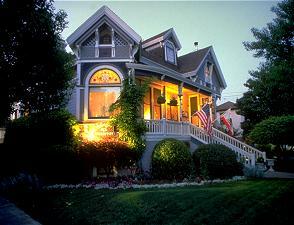 Romantic Country Inns, Getaways and B&Bs offer a great Napa lodging alternative to big hotels.